It’s been a long time since I published a post. Very busy working in my new company to revamp the product portfolio and its marketing. It’s a B2B software company and the question of course was: “what to have on our radar to think about the future releases of our applications”. My nickname in this new company is Emmanuel 2.0, you wonder why? That’s because you’re a newcomer to this blog. So here we are, trying to figure out the major Internet trends. I’ve always been fond of supporting my hunches with data. So let’s deal with the claims first and the figures to follow. Claim#2: The Internet is growing mobile (2.8B mobile phones in 2007 growing to 3.8B in 2011 to be compared with 980M PCs in 2007 growing to 1.5B according to Gartner). “Worldwide sales of mobile phones to end-users surpassed 1,15bn units in 2007, a 16% increase from 2006 sales”, Computing SA citing Gartner. And if you’re wondering what is the major customer benefit iPhones brings (4M units sold in 2 quarters), here is my take: real and easy web browsing. I can at least speak for myself, I do not fire up my PC at home to navigate on the web and checkout my facebook page, I use my iPhone. Now with the additional figure about e-commerce: “eMarketer predicts that online retailers in the US will ring up over $100 billion more in sales in 2012 than they did in 2007. Sales growth will come mainly from consumers who are shifting their spending from traditional retail stores to the Internet.”, eMarketer. Take a look at the table for more details, but you can easily figure out that buying behavior and for that matter marketing web behavior are shifting big time. I would strongly advise to revise your marketing mix to accommodate at least 20-25% to web marketing including viral marketing techniques. Finally, and I’m sure we’ll agree easily, web content has also shifted to video and pictures. For this one, I’ll let you find the figures. Let’s rock marketing on the web for 2008 fellow marketeers. Let’s draw a rapid conclusion here, mobile phones or more widely Mobile devices will have the next big impact on the web as carriers evolve their business model for Internet access to a flat monthly fee as for broadband. 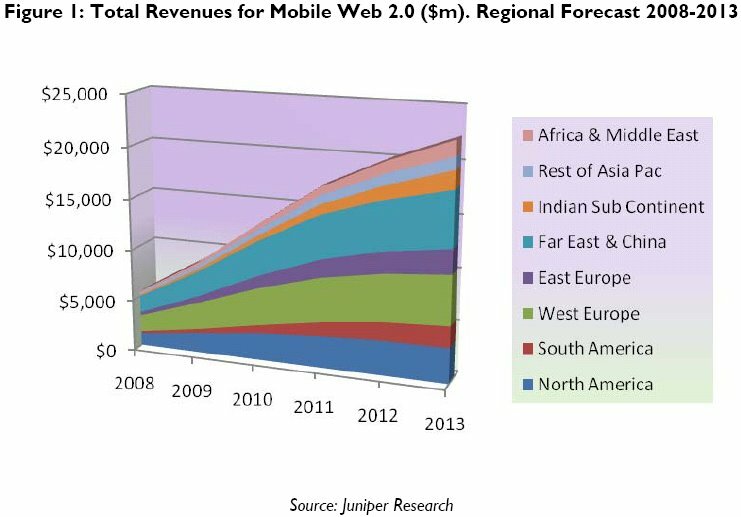 The next massive disruption on the net is already happening: Web 2.0 goes mobile. Consumers will voice their opinion, pictures and videos to share visual news taking place close to them directly from their phones! Tell me fellow marketers, would you ignore this bidirectional medium when you know Marketing 2.0 is already here? What a big bet! 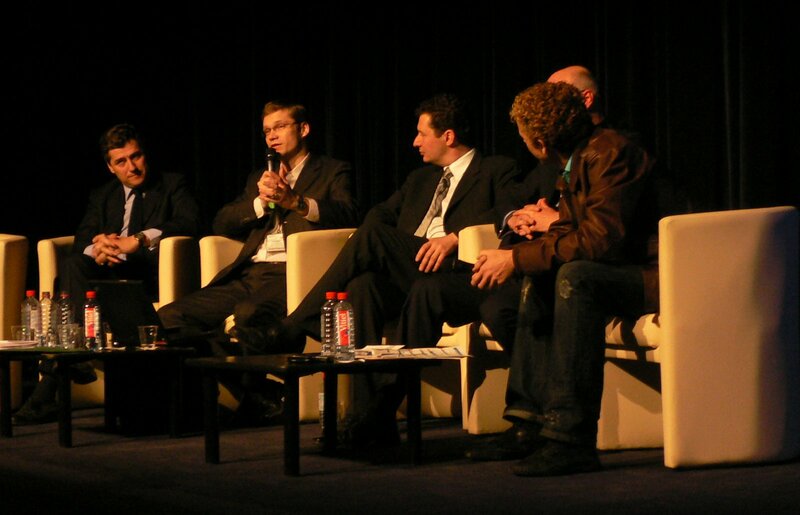 I was attending Ad Tech Paris yesterday, a good way to capture on-line advertising trends. Among other interesting sessions, I was appealed by the mobile advertising one called “Mobile advertising – the long and winding road” coordinated by the Mobile Entertainment Forum (MEF). Speakers, see picture from left to right, were Marc-Henri Magdelenat — Screentonic, Minh Tran — Nokia Mobile Advertising, Patrick Parodi — Amobee & MEF, Richard Saggers — Vodafone and our moderator Gilles Babinet — Eyeka. They covered a lot of ground to explain how important was mobile advertising among our marketing tactics and how unique was its approach. Not to forget for instance that permission marketing in this space is mandatory, nothing is more personal than your phone, right? Mobile Phones are the only new device that people carry all the time since watches were introduced. Some do even sleep with these! Keep in mind as well that consumers are actually paying to receive adverts so we should keep ads short and relevant. And finally, coupons on mobile phones — yes, bar codes on your phone to present to the store you’re in or close to — are far easier to use for consumers than traditional ones or even web ones, especially when coupled with your location. 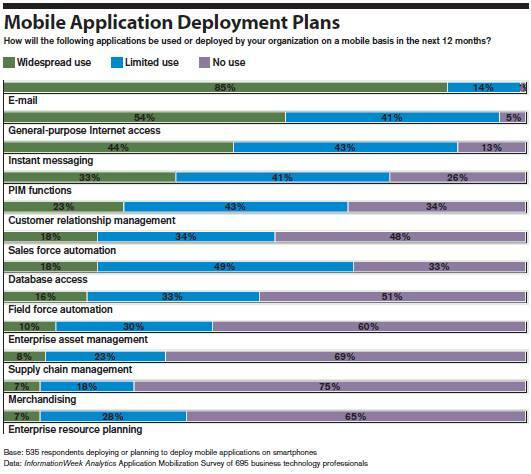 Having experienced the mobile industry at Sun Microsystems myself, when marketing the Java platform, I could not agree more to the effectiveness of mobile marketing. Europe and Asia are for sure ahead of the curve about it, as mobile devices connected to the Internet are spreading fast there. The UK even have a dedicated web-zine about it called Mobile Marketing Magazine. Amazing! Impulse and web 2.0: as you carry your phone with you all the time, nothing would be more natural than to use it for an impulsive buying decision and to channel back your opinion to the brand right away. Not to mention that within the next 3 to 5 years, mobile devices will become the primary Internet access for consumers, as Japan experienced already. The user experience will significantly improve as well, check the iPhone introduction by Steve jobs here in Marketing 2.0 to get a feel for it. Marketing 2.0 minded marketers cannot ignore mobile marketing when planning for the next campaign. Consider it for sure in your mix, but very carefully as this could be a double edge sword.